Melville's Thomas Yates, Ryan T. Jacobs, Tim Skerpon and Jim Meyer. Photo by Hanmi Hubbard Meyer. I recently wrote a bio for the Portland-based band Melville in anticipation of the release of their new EP, Maquette. Here's the long version of the several blurbs I produced. Melville's Maquette is just that: a small, preliminary model. The six-song EP is a starting point—potentially an outline that'll be expanded upon, possibly a preview of what's to come, but also maybe just an exercise that will enable the four-piece, Portland-based band to chart completely new sonic territory. The future unknown, the model currently on display is the combined effort of a band in the making since 2011 when songwriter and vocalist Ryan T. Jacobs first debuted Melville at the LaurelThirst Pub. Since then, he's found not just a steadfast lineup but also a family in band members Tim Skerpon (drums), Thomas Yates (bass) and Jim Meyer (keys). While today Melville might peg themselves as melodic indie rock, somewhat nebulously in an aural area "between Radiohead and Americana," as described by Jacobs, Melville knows this is just the beginning. Melville's introductory offering, Maquette, was recorded at Type Foundry Studios with Adam Selzer (M. Ward, Sallie Ford, Blind Pilot, The Decemberists, Peter Buck of R.E.M., She & Him) and mastered by Gus Elg at Sky Onion (Typhoon, Nurses, Horse Feathers, Blue Cranes), and its music has garnered radio play on Portland stations like KINK, KNRK and KZME. Much as life evolves depending on the whims of the world, so does the music of Melville as the band grows to know one another's talents and idiosyncrasies, becoming comfortable in their own skin. All multi-instrumentalists and experienced songwriters, good intuition is perfected by critical ears and a mentality that this band's sonic palette is limitless. With deep roots in American rock 'n' roll, the band members feel strongly that they're still discovering their collective selves. Continually looking forward, Melville is most excited about the future because of how well the past has gone. And while this exploratory attitude is unflinching, what's sure not to change is Melville's delivery: expertly crafted, emotive songs. Drenched in earnestness, Jacobs' visceral vibrato personalizes each lyric for every listener, whether listening to a Melville record or seeing the band perform live. It's music that moves you, which is exactly why Yates was adamant about joining the band as a permanent member following a one-off Mississippi Studios performance in 2012. As the band grows together interpersonally, so will the music transform sonically. Founded on openness and a collaborative spirit, there's a tangible longevity to Melville that begs the group to explore and discover new layers to its sound. For now, Maquette is the base layer—but Melville will be charting a fresh course from here. 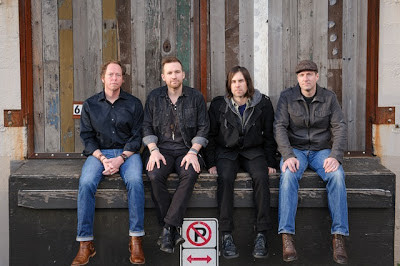 For more on Melville, read my article and interview with band leader Ryan T. Jacobs on OMN and check them out at their upcoming album release gig on Thursday, October 24th at Mississippi Studios with Oh Darling and Spirit Lake.